For determining the DBMS of the year, we subtracted the popularity scores of January 2017 from the latest scores of January 2018. We use the difference of these numbers, rather than a percentage, because that would favor systems with a tiny popularity at the beginning of the year. The result is a list of DBMSs sorted by how much they managed to increase their popularity in 2017, or in other words, how many additional people started to communicate about it in one of the ways we measure in our methodology, for example job offers, professional profile entries and citations on the web. While in our last year's popularity ranking PostgreSQL already ran in on place 3, 2017 was an even better year for PostgreSQL. With a total gain of 55.81 scoring points (+17%) and improving its score in each of the single monthly rankings of 2017, it outperformed all other systems in 2017. During 2017 PostgreSQL passed MongoDB and has secured it's 4th rank in the DB-Engines popularity ranking. The new release of PostgreSQL 10 certainly helped to further stimulate interest in that product. With the introduction of Declarative Partitioning, improved Query Parallelism, Logical Replication and Quorum Commit for Synchronous Replication, PostgreSQL 10 specifically focused on enhancements for effectively distribute data across many nodes. Elasticsearch has already been one of the top three systems in our DBMS of the Year award in 2014. It is by far the most popular search engine (ahead of Solr and Splunk) and increased its score by 16.38 points (+15%) in 2017. Two facts may have contributed to the continuous success of Elasticsearch: the release of Elasticsearch 6 in last November and the effort of Elastic, the company behind Elasticsearch, to create with Elastic Stack an ecosystem around Elasticsearch, including tools for data collection, data visualization and machine learning. MariaDB improved its score by 13.26 points (+29%) in 2017. It started the year 2017 on rank 20 and rose to rank 17 by the end of 2017. It is interesting to note that MariaDB's large brother MySQL lost 66.58 scoring points (-6%) in the same period. It would be no surprise, if with the GA release of MariaDB 10.3 and the support by some Linux distributions for MariaDB that trend continued for 2018. 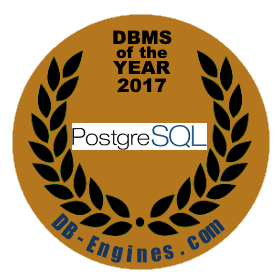 We congratulate PostgreSQL, Elasticsearch and MariaDB for their success in 2017. Oracle, MySQL and Microsoft SQL Server. Although their scores dropped, they are still undisputedly leading the DB-Engines popularity ranking. Time Series DBMS are the DBMS category with strongest growth. They impressively increased their score by about 70% in 2017. Cloud based DBMS further improved their popularity, being a well-accepted alternative to on-premise DBMS installations. We are looking forward to monitoring the DBMS trends in 2018. Jonathan S. Katz, Director, United States PostgreSQL Association: "The PostgreSQL community sincerely thanks our users for the continued rapid adoption of PostgreSQL. We will keep innovating and producing features to ensure our users have a wonderful experience using our platform and the entire PostgreSQL software ecosystem." Michael Howard, CEO, MariaDB: "We are honored to be recognized by DB-Engines, and grateful for the continued support of our growing MariaDB user community. This recognition is evidence of the shift away from proprietary databases to open source alternatives, and we are committed to continued innovation for our users in 2018."